Already a hit in the German-speaking countries, the much-lauded new book by Niels Pflaeging & Silke Hermann is about to be published. More on the Complexitools publishing campaign, and the book, coming soon! The book contains 33 Complexitools and 22 Complexideas: A fresh start for organizational development and leadership in dynamic times. This book is dense, fun, thought-provoking, counter-intuitive and gorgeous. Lush 8x8in (203x203mm) format. Paperback. Fully colored, illustrated. 144 pages. Our new product line: Accessible and content-rich! Our books are unlike most others. They are incredibly to the point. Visualized and fully colored. Practically theoretic. Inspiring. Featuring cutting-edge insights. And enormously entertaining. The book´s first readers have thus given us a big thumbs up. Add on that a seminar format that is hugely engaging and that has been designed and tested by Niels throughout 7 years, while teaching at several universities and facilitating courses. That is the power of organizing for complexity! If you are a blogger, a journalist, a social media maverick: ask for review copies of the books. Our books are compact, new and exciting. Our core topics are work, leadership, and organizational transformation in the age of complexity. BetaCodex Publishing books are available internationally - through the most powerful worldwide distribution network, which is the Ingram distribution network. So far, we have edited in English and Portuguese - further languages will eventually come up, as well as additional products, and new formats. The shop on this webste allows you to buy all our titles for worldwide delivery, at excellent pricing and shipping cost. Check it out. 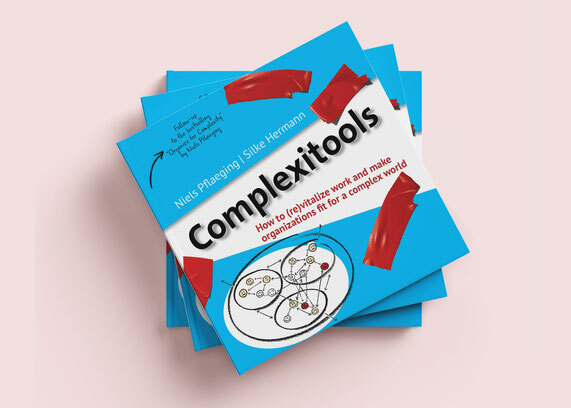 Organize for Complexity and Complexitools are also 1- to 3-day workshops, and a methodology for organizational, or leadership development programs in companies of all industries and sizes. Niels Pflaeging & Silke Hermann have extensive experience in designing and delivering seminars and programs globally. Customized to your need. Your situation. Your language. Your team. Your company. We make use of cutting-edge learning didactics and a dizzying variety of intervention formats. An international team of experienced advisors and facilitators can assist you in running seminars for you, or with embedding our content in your development programs. "Organize for Complexity is the essential handbook for management in the network era."